Most of Newfoundland and parts of Labrador can expect a bit more winter this week, with a mix of winter storm warnings, wind warnings and rain in the forecast. “Basically, we have a mixed bag of precipitation for everybody,” says Allison Sheppard, a meteorologist with the Environment Canada weather office in Gander. Precipitation is set to move in Monday evening as wet snow on the Avalon Peninsula, before switching to ice pellets, freezing rain and then rain into Tuesday morning. That weather will be far more wintry for the Northern Peninsula and southern Labrador, with upwards of 25 centimetres of snow expected to fall through to Wednesday morning, Sheppard said. Overnight winds are expected to be around 80 km/h for much of the island, Sheppard said. “I’m sure people will hear that overnight, but again tomorrow they will diminish pretty quickly in the morning,” she told CBC’s St. John’s Morning Show. Marine Atlantic moved its Monday morning sailing between Port aux Basques and North Sydney, N.S., up an hour earlier, in order to get ahead of the weather system. 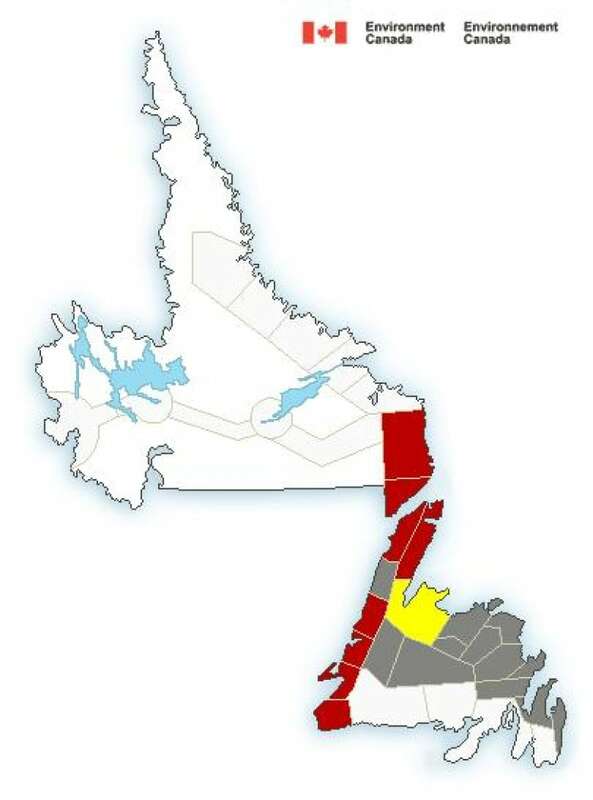 Wind gusts in the Wreckhouse area are expected to hit nearly 130 km/h Monday evening, with wind warnings also in effect for other areas of the west coast, including Bay St. George, Corner Brook and Gros Morne. Sheppard said it’s not clear just how much snow in total will fall on the western and Northern Peninsula — since those strong winds will be blowing it around so much — but it could be as much as 30 centimetres. If that makes you want to give up hope for springtime in Newfoundland and Labrador, Sheppard sees a silver lining: things might warm up a bit by the weekend.